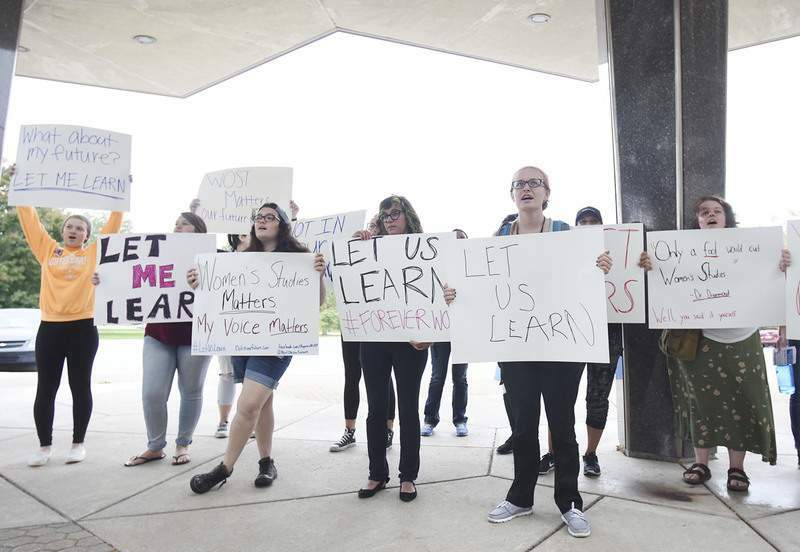 Samuel Hoffman | The Journal Gazette Sophia Malmquist, 19, far right, a women's studies major at IPFW, chants "Let us learn" on Tuesday with about 20 students from a Gender Sexuality in Pop Culture class outside Kettler Hall at IPFW. The women were protesting the elimination of the women's studies program, outside the office of Vice Chancellor of Academic Affairs Carl Drummond, who is quoted on Malmquist's sign. Moving ahead with major restructuring, IPFW will eliminate several degree programs and departments, the campus was told today. "It's a sad day for IPFW," said Jeffrey Malanson, presiding officer of the Faculty Senate and an associate professor of history. Geology, philosophy and women's studies will be eliminated Jan. 1. Degree programs in French and German are among those to be suspended. In addition, some departments are to be merged. How jobs on campus will be affected remains in flux, Malanson said. The changes follow a proposal released in January from a state-mandated study that would split IPFW into two schools based on Indiana and Purdue university strengths. Purdue currently provides administrative oversight of IPFW, with students able to receive degrees from both Indiana and Purdue. The trustees of Purdue and IU voted in June to extend their IPFW management agreement for five years and to put off any decision to realign the school until December. But a meeting last week among IPFW and Purdue officials made clear the Purdue board of trustees wanted significant changes, Malanson said. Under the proposal, IU would oversee medical and health programs, while Purdue would administer the remaining programs. Faculty members, described by Malanson as "livid," currently are working on ways to make the community more aware of what's going on, he said. For more on this story, visit www.journalgazette.net later today or see Wednesday's print edition of The Journal Gazette.